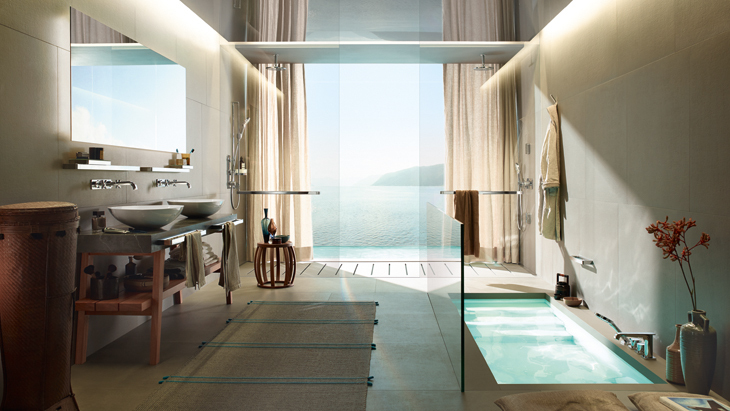 For years, bathroom professionals have relied on Axor collections designed by Antonio Citterio. The timeless, elegant Axor Citterio E bathroom collection continues this success story and opens up new possibilities in bathroom planning. The collection’s SoftCube design is characterized by a combination of clear lines and soft shapes. These express a feeling of luxury and elegance and are also the reason why Axor Citterio E blends in with such a wide range of style worlds. Axor ShowerSelect concealed products can also be combined stylishly with Axor Citterio E. As a result, bathroom planners can simply select the appropriate product from the comprehensive range. The high-quality 38x12 thermostat modules offer intuitive control of the consumers. This is particularly ideal in hotel bathrooms, where first-time users appreciate the comfortable operation. The thermostat modules, shut-off valves and diverter valves are based on the tried-and-tested Axor ShowerCollection concealed system in order to ensure precise installation. Matching accessories for Axor Citterio E can be found under Axor accessories. We recommend products from the Axor Universal accessories range. The single-hole lavatory faucets are available in four different heights for free-standing installation or wall mounting. Three-hole lavatory faucets with classic cross handles are also part of the collection. New thermostat modules based on the 12x12 principle of the Axor ShowerCollection are available for concealed installation, as are Axor ShowerSelect thermostats. The bathroom is rounded off by the free-standing bathtub thermostat and four-hole thermostat faucet for tile or bathtub rim mounting. The elegant shower set combines a handshower with shower bar, hose and high-quality metal slide. Additional options are offered by the 12x12 shower module in the typical SoftCube design. It can be used individually or in units of four, six or nine modules as a body, shoulder or overhead shower. Matching overhead showers are also available for the collection. With Axor Citterio E, you can also combine products from the Axor ShowerSelect range at the shower and bathtub. The clear symbols and convenient Select buttons mean that they can be operated intuitively at the touch of a button. The high-quality metal wall flanges are easy to clean and durable. Their subtle shapes blend in perfectly with the timeless design of the collection.